IGPP's Center for Planetary Sciences (CPS) is the outgrowth of the former Center for Planetary Chemistry and Physics, reflecting the Institutes’ major push into planetary astronomy. Since 1995, over 300 planets have been identified in solar systems profoundly different from ours. These planetary systems constitute a laboratory in which to test hypotheses about how solar systems form. The most pressing issues include the processes that form low-mass stars, how planetary systems resemble and differ from each other, the habitability of their planets and whether any are inhabited. IGPP’s goal is to provide the nexus between planetary science and extra-solar planetology in which astronomers, cosmochemists, planetary dynamicists, and geobiologists can come to understand the origin and evolution of other worlds and their surface envelopes and explore the conditions that favored the rise of life on Earth and infer habitability elsewhere, while continuing to make fundamental discoveries. The surprisingly low geotherm under which 4.2 billion-year-old zircons formed, together with inclusion assemblages characteristic of subduction-related magmas, indicates their formation in a convergent margin environment. This implies that plate tectonics initiated on Earth almost immediately following planetary formation. Spacecraft images show ‘spirals on the sea’ in sunlight and radar reflectance but none have been measured in situ. 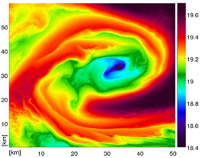 In oceanic simulations with high spatial resolution, spiral structures have been shown to emerge from the instability and wrap-up of cold surface temperature filaments undergoing frontogenetic collapse induced by surrounding mesoscale eddy currents.